Location of Wernicke’s area (top), which was previously considered critical for both word and sentence comprehension. A new Northwestern Medicine study shows that different brain areas (bottom) control sentence comprehension (green) and word comprehension (yellow). For 140 years, scientists’ understanding of language comprehension in the brain came from individuals with stroke. Based on language impairments caused by stroke, scientists believed a single area of the brain – a hotdog shaped section in the temporal lobe of the left hemisphere called Wernicke’s region – was the center of language comprehension. Wernicke’s was thought to be responsible for understanding the meaning of single words and sentences, two separate and critical functions. But Northwestern Medicine scientists have updated and redrawn the traditional brain map of language comprehension based on new research with individuals who have a rare form of dementia that affects language, primary progressive aphasia (PPA). 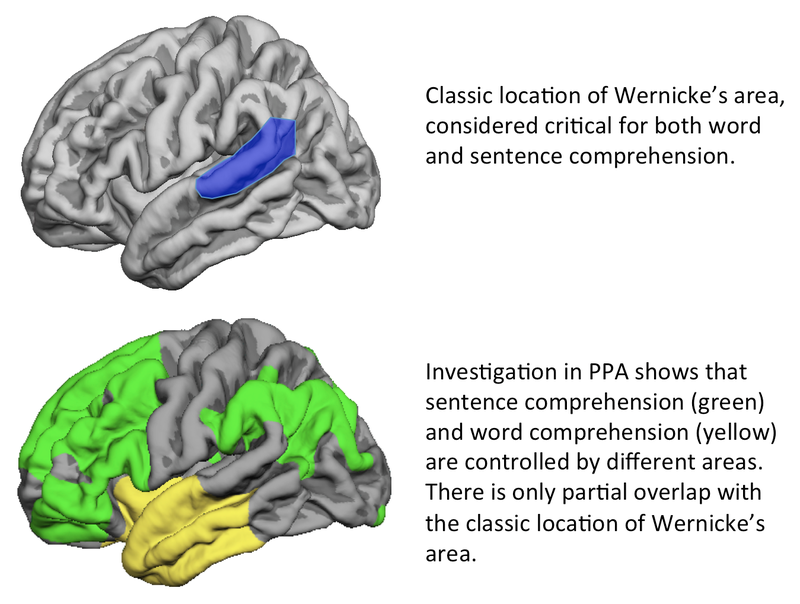 The new research, published in Brain, shows word comprehension is actually located in a different brain neighborhood – the left anterior temporal lobe, a more forward location than Wernicke’s. And sentence comprehension turns out to be distributed widely throughout the language network, not in a single area as previously thought. “This provides an important change in our understanding of language comprehension in the brain,” said lead study author Marek-Marsel Mesulam, MD, director of Northwestern’s Cognitive Neurology and Alzheimer’s Disease Center (CNADC) and professor in the Ken and Ruth Davee Department of Neurology. Strokes cut off blood supply to regions of the brain and cause destruction of both neurons and fiber pathways passing through that region. In the 1870s, a scientist named Carl Wernicke observed a specific region damaged by stroke and resulting language impairments. This area, consequently named Wernicke’s region, was identified as the seat of language comprehension. Marek-Marsel Mesulam, MD, director of Northwestern’s Cognitive Neurology and Alzheimer’s Disease Center, was the lead author of the study that sheds new light on the brain’s ability to process language. 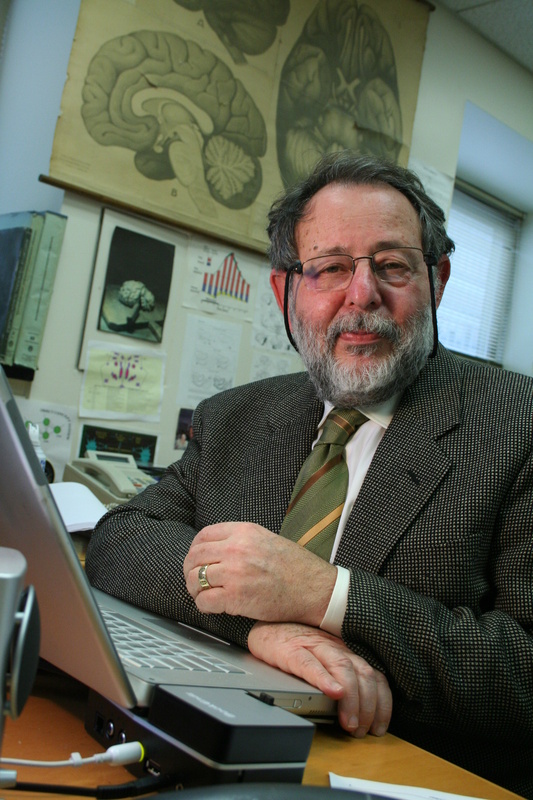 But Mesulam, the world’s leading expert in PPA, for years had been puzzling over the fact that his PPA patients with damage in Wernicke’s area did not have the word comprehension impairment seen in stroke patients. They still understood individual words. And their sentence comprehension was inconsistent; some understood sentences; some didn’t. He and colleagues began a study of PPA patients, conducting quantitative MRI imaging of their brains and testing their language. Emily Rogalski, ’07 PhD, research associate professor in CNADC, conducted the imaging in 72 PPA patients with damage inside and outside of Wernicke’s area. She measured cortex thickness in all of these areas. Cortex thickness is an indirect measure of the number of neurons and brain health. Thinning of the cortex in PPA indicates the destruction of neurons by the disease. 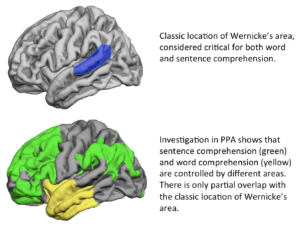 Rogalski found PPA patients who lost cortical thickness in Wernicke’s area still could understand individual words and had varied impairment of sentence comprehension. None of these patients had the global type of comprehension impairment described in stroke patients with Wernicke’s aphasia. Severe word comprehension loss was only seen in PPA patients who had diminished cortical thickness in a region of the brain completely outside of Wernicke’s area, in the front part of the temporal lobe. This part of the brain is not prone to the effects of stroke, so its role in comprehension had been missed in prior language maps. The discrepancy between the traditional map of comprehension and what was seen in PPA can be explained by the different ways the two diseases injure Wernicke’s area. In PPA, the neurodegenerative disease does not destroy the underlying fiber pathways that allow language areas to work together. But, in stroke patients, those critical highways passing through Wernicke’s had been blown up. So, the messages from other parts of the brain to the left anterior temporal lobe – the spot for word comprehension – were simply not getting through, Mesulam posits. “In this case, we saw a different map of language by comparing two different models of disease, one based on strokes that destroy an entire region of brain, cortex as well as underlying pathways, and the other on a neurodegenerative disease that attacks mostly brain cells in cortex rather than the region as a whole,” Mesulam said. Other Northwestern authors on the paper are Sandra Weintraub, PhD, professor in Psychiatry and Behavioral Sciences and Neurology, and Cynthia Thompson, PhD, professor in Neurology and the Northwestern University School of Communication. The research was supported by grants DC008552 and DC01948 from the National Institute on Deafness and Communication Disorders, AG13854 from the National Institute on Aging, and NS075075 from the National Institute on Neurological Disease and Stroke, all of the National Institutes of Health. Members of the media, please contact Marla Paul via e-mail at marla-paul@northwestern.edu or at (312) 503-8928 for more information about this story.